TSD Tungsten Arky Flipping Jigs provide a more compact presentation than lead or brass, and are also much harder which helps transmit bottom contours to the fisherman. TSD Tungsten Arky Flipping Jig increases sensitivity and provides a smaller profile to prevent more hang-ups. The powder coating color resists chipping, and yields a longer life to the jig, increasing your chances of landing that big one. Offered in an array of proven colors to match any conditions. These jigs are excellent. 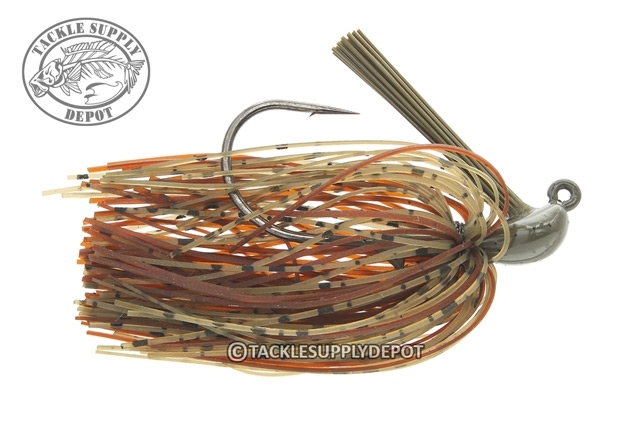 If you are looking for a jig with a strong hook and hand tied skirt look no further. I have a box full of these jigs and always have one tied on! My favorite colors are the PBJ and camo craw!